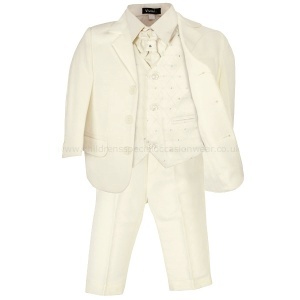 Ivory 5 piece jacket suit for a baby boys, toddler or older boy, perfect outfit for any special occasion including a christening, wedding as a guest or pageboy, formal occasion etc. Jacket: Fully lined ivory jacket, double pockets on front with single breast pocket, three centre buttons with buttons on cuffs. Waistcoat: Ivory satin effect waistcoat with lurex self-pattern on front with diamond, fully lined, double pockets, 3 clear centre buttons, adjustable strap/buckle on back for perfect fit, in ivory. Trousers: Pleated ivory trousers, button fly, double pockets, belt hoops, small turn-ups, elasticated on rear. 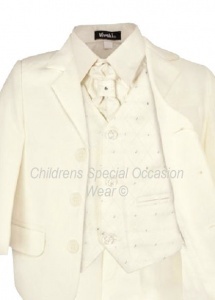 Shirt: Long sleeved ivory shirt, full-length centre buttons, buttoned cuffs, down-collar, perfect compliment to the waistcoat. Cravat: Ivory satin effect cravat with lurex self-pattern with diamond, velcro fastening at the back, complimenting the suit perfectly, in ivory. This ivory 5 piece outfit will make him look like the perfect handsome gentleman at a christening, wedding as a pageboy / guest or a special occasion. 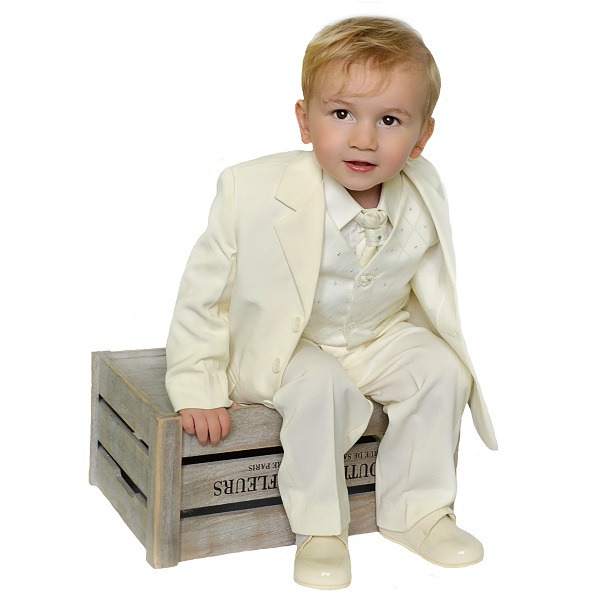 Sizes 0-3 months up to 10 years. Everyone commented on how lovely my son's suit was. Thwy all thought that I must have paid a lot more for it than I did. Very happy with the purchase and the dispatch time.